The mystery of the Mary Celeste is considered to be one of the greatest ocean mysteries of all time. The brigantine was discovered sailing the ocean without her crew. Their fate has baffled and intrigued the world for over a century. The ship was in relatively good condition, no major problems that would account for a catastrophe, no ransacked cargo, and the crew had left behind their most treasured material possessions. Why? No one knows though many hypothesis have been presented through the years. I knew little about the Mary Celeste before my investigation. I’d read a few short accounts about it when I was in elementary school and recalled that the ship had been found sailing without her captain and crew and that it looked like they’d surely met some ill fate. Well, I was determined to plunge the depths of this mystery and solve it once and for all. 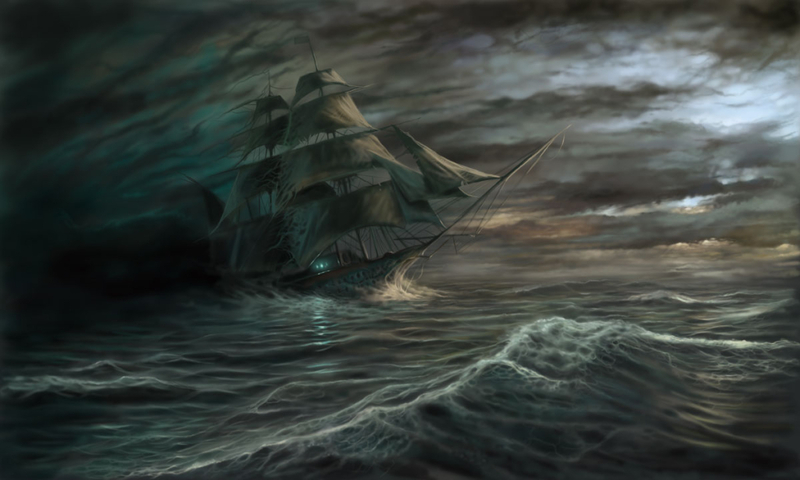 My psychic connection to the Mary Celeste was unexceptional, and, yet astoundingly revealing at the same time. In fact, I was able to solve the mystery from a single word. After several unsuccessful attempts at connecting, all I saw was water, water, and more water–huge waves crashing over me as if I’d been cast into the sea and couldn’t find my way out. And then, suddenly, I was on the ship’s deck, the Captain stood before me, glaring down upon me and refusing to let me go any further on his ship. Yet, he seemed to know exactly what I’d come for, so perhaps I wasn’t the first who’d attempted a psychic investigation of the ill-fated ship. His expression as hard as stone, he seemed totally perturbed by my intrusion, but he uttered one word: “Alcohol.” And then the connection broke. Surely, I thought, there must be something more to the mystery than alcohol. I couldn’t fathom what this meant. Yes, some spirits are definitely more talkative and friendly than others. Perhaps the unfriendliness on the Captain’s part stemmed from archaic notions about psychic matters. Or perhaps he was confused and was trying to protect his family (if they were on board), or maybe he wanted to be alone in his private hell (I believe he feels guilty about what happened.). I simply don’t know why he’s so menacing. I do know that he, and probably his crew and family, are not at rest and are still sailing the seas. Anyhow, back to the matter of alcohol. At first I couldn’t grasp the significance of what the Captain was trying to tell me, had no idea what it meant? I thought that one simple word couldn’t possibly be the answer to one of the greatest sea mysteries of all time. But during the research phase of my investigation, I found out that alcohol, indeed, provided the solution. Suddenly that one little word had a powerful meaning for it had indirectly claimed the lives of those on board the Mary Celeste. Mind you, it wasn’t drinking alcohol, but a commercial type, such as ethanol, and the ship was loaded to the gills with it as I explain below. The Mary Celeste, originally named the “Amazon” has an interesting history. Some believe she was cursed. I found no substantial evidence of that, but misfortune often found her. Launched in the spring of 1861, her first captain died before completing the maiden voyage. She accidentally rammed and sunk an English brig in London. Later, a crew abandoned her, thinking she was sinking when a storm drove her ashore at Cape Breton. But she was recovered, repaired, and in 1872, she fell into the command of Benjamin Spooner Briggs. She’d just undergone renovations in New York and Briggs thought she was a beauty the first time he laid eyes on her. On November 2, the ship was loaded with 1701 barrels marked “alcohol.” The cargo was worth $36,000. Again, it’s important to note that this wasn’t drinking alcohol but a form of industrial alcohol such as ethanol or methanol. Briggs ran a tight ship and there was no drinking on board. None of the seven crew members were allowed to bring their own alcohol on board the vessel. It was the first time in Briggs’ 20 years of experience to haul alcohol. It was considered a dangerous cargo, because of its flammability; nevertheless, he’d decided to take his wife and two-year-old daughter, Sophia, along on the trip–his first errors. And on November 5, 1872, the ship sat out for Genoa. A nasty storm came up, and she was forced to drop anchor off Staten Island where she sat for two days, but then she set off again to continue her Eastbound trek, but her crew was never to be seen again. Captain Moorhouse of the brigantine, Dei Gratia, was the first to spot the ghost ship on December 5. From the moment he spotted the vessel, he had a bad feeling about it. Something about the ship gave him pause. Studying it through his spyglass, he felt in his gut that something was amiss but couldn’t figure out what. Soon, he realized the reason for his misgivings–the ship was hardly flying any sails. Odd, in such a light breeze. He feared that the ship could be in trouble. The Dei Gratia moved in for a closer inspection, and he noted that the ship seemed to be fighting her course, bucking the waves and ambling without a purpose. And there appeared to be no one aboard the vessel. He decided to board her. First Mate, Deveau, and two other men launched a lifeboat. On board the mystery ship, the deck was dark, spooky, and silent, except for the occasional creak of wood. They found no one and concluded that the crew had abandoned the ship. Yet they couldn’t understand why. There was no sign of significant damage to the ship, no leakage or holes in the copper sheathing. She was dragging a few rigging lines, but nothing serious. The rudder was intact, and the ship was sitting fine and sure in the water. Sails hung from one yardarm. The port side rail was lying on the deck and another torn piece of sail dropped over the galley’s stovepipe. She’d knocked around a bit and the binnacle, a box to store the ship’s compasses, etc., had fallen and busted on the deck as if ripped from the deck house but that could have been the wind’s doing. The deck houses were dark, a door swung back and forth, setting the men’s nerves on edge. And the wheel turned as if a ghost was at the wheel. In actuality, the pressure of the water on the rudder was turning the wheel. They wondered why the crew hadn’t tied the wheel off. Any sailor would have known to do so when leaving a ship at sea. 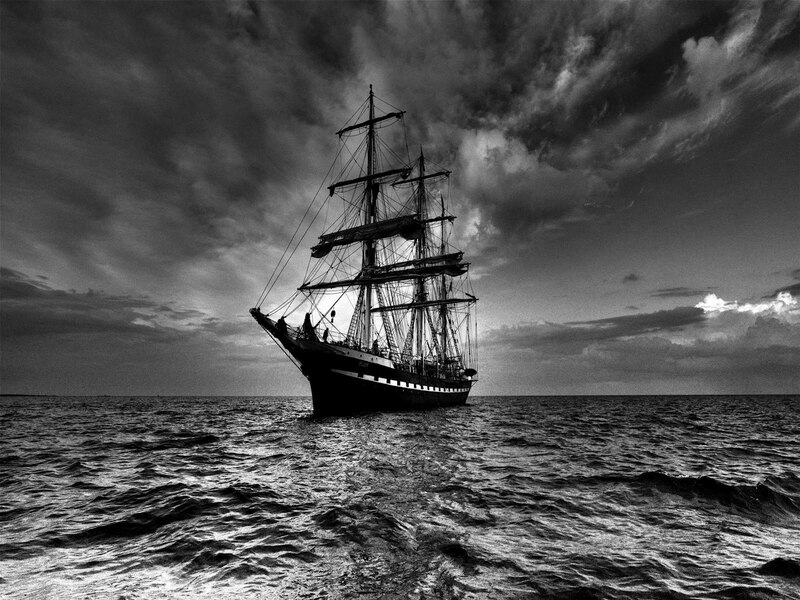 If the wheel was tied off, the ship would move in circles, if not, it would leave a sailor at the mercy of the sea. In the captain’s cabin, they noted that the beds were unmade though the rest of the room was tidy. Everything was saturated with water, accounting for the musty smell that permeated the vessel. Several inches of water stood in the galley alone. They sounded the pumps, noticing that the ship’s sounding rod was lying next to one of the pump boxes. Below, there was 3.5 feet of water in the bilge, but it was not an alarming amount. Again, the men were struck by the certainty that the ship appeared to be sound and in no danger of sinking. What then, had happened to the crew? Why had they left so quickly? Strangely, all of the hatches were open as were the entrances to the deck houses. Even the skylight in the captain’s cabin was propped open. Every doorway and window had been thrown back. Again, the men were baffled. They found the ship’s log, and it revealed nothing out of the ordinary, nothing that would shed light on what had happened. Only routine information had been recorded except for the foul weather that the crew had endured for most of the journey. There was also a map, with drawn lines showing the way the ship had traveled due East from New York, stopping west of the Azores, several hundred miles from the ship’s current location. The final entry was on November 25, reportedly the first calm day they’d had on the journey. In the crew quarters, they found that the men had left behind their trunks containing their treasured personal items. In addition, they’d left their foul weather gear and pipes behind. Sailors went no where without their beloved pipes. Obviously, those on board had abandoned the ship in a hurry, but the men could still find no satisfactory answer to account for the crew’s speedy departure. None of the evidence made sense. If the crew had met with foul weather why were all of the hatches and windows open? And if they’d left for any other reason, why had they left behind their possessions? A pirate attack was unlikely as nothing appeared to be missing except for the crew. Even the cargo appeared to be unmolested except for a few busted kegs of alcohol. The men, certain that some misfortune had fallen upon the crew, decided to take the ship in for salvage. Unfortunately, once they brought the ship into port, their efforts were met with suspicion, and an investigation followed. But no evidence of wrong doing on the part of the Dei Gratia’s crew was ever found. Eventually, after weeks of grueling questioning, the charges were dropped. Yet the men’s careers were ruined, and they had made little on their salvage claim. Was the supposed curse on the Mary Celeste at work again? According to Captain Briggs himself alcohol was the key to this mystery. That, along with the clues that were revealed during the ship’s examination by the Del Gratia crew, presents a solution about what happened on board during the crew’s final moments. In fact, the pieces of the puzzle falls perfectly in place. But first, we need to step back to the beginning of the ship’s journey. The crew endured weeks of foul weather. The weather was unbearably rough throughout the journey and would have kept the crew working around the clock. On November 24, they encountered the worst storm yet near the Azores, which would have kept them on their toes all night. In the morning, the storm had let up. Surely, a welcome relief. There was almost no wind, but they were probably too exhausted to care. At last, they could rest. And finally, they could ventilate the hold, which was of major importance as this type of cargo needed to air occasionally due to fume buildup. They’d been unable to ventilate the ship for weeks due to the rough weather that had plagued them. They were in for an unpleasant surprise, however, because as soon as the hatches were thrown back, deadly fumes wafted from the hold, making the crew nauseous, light-headed, and dizzy. The rough weather had broken some of the barrels of alcohol and 450 gallons of it filled the ship’s bilge. The crew, seeking fresh air, opened all of the hatches, doors, and windows. But it wasn’t enough. The fumes were too potent and there wasn’t a breeze to carry them off. The crew had no choice but to leave the ship until the fumes abated. Leaving their valuables because they expected to return, they used the peak halyard (the rope that drew the sail up the main mast) as a towline for the lifeboat. They had to remain connected to the ship. Without it, the lifeboat would drift from the ship with no way to catch up to it. The rope, the longest line, provided the tether. This is the reason why the Dei Gratia crew found the halyard hanging over the side of the ship–it had been attached to the front of the launch. If the weather got bad, they’d draw the small boat back to the ship; however that wasn’t possible, because the crew made two fatal errors that resulted in tragedy. Firstly, the crew failed to haul in the sails. The sails on the foremast were left unfurled. This is probably because the crew would have had to go aloft via the ratlines to draw them in, and, perhaps they were too dizzy or ill to make the treacherous climb. Or maybe they just weren’t thinking clearly due to the potent fumes. Secondly, they failed to tie up the ship’s wheel. They either neglected to do so in their haste to flee the ship, or they forgot. And then too, the weather was unusually calm. Perhaps they thought that the ship wasn’t going anywhere anyhow. At any rate, they got into the cramped lifeboat (or yawl), eight men, a woman, and a child, and they drifted a bit for some fresh air. As soon as Briggs’ head had cleared, he surely realized the dangerous situation they were in. With four foresails still unfurled, a gust of wind could set the ship off and leave them a deadly distance behind the vessel. Perhaps he’d hoped for the best, knowing he had no option but to wait this out and hope that the weather remained calm. But fate was against him. That afternoon, the weather rapidly changed when a dreaded gale came, churning the water. Briggs might have tried to pull them closer to the ship, using the towline, but it was too late. The sails caught the wind, and the ship took off, quickly picking up speed. The crew probably began a tug of war to reach the ship. They would have struggled as long as their strength held out while waves violently rocked the tiny vessel they were in. At some point, the halyard broke, thus the reason it was hanging broken over the side of the ship, and the rest happened quickly. They would have paddled futilely against the powerful waves with no hope of catching up to the ship. They were lost at sea and no one knows if they were claimed by the waves or succumbed from a lack of food or water. The only certainty is that they met their deaths, and it all came about because of alcohol.